Two-pore-domain potassium (K2P) channels are key regulators of many physiological and pathophysiological processes and thus emerged as promising drug targets. As for other potassium channels, there is a lack of selective blockers, since drugs preferentially bind to a conserved binding site located in the central cavity. Thus, there is a high medical need to identify novel drug-binding sites outside the conserved lipophilic central cavity and to identify new allosteric mechanisms of channel inhibition. Here, we identified a novel binding site and allosteric inhibition mechanism, disrupting the recently proposed K+-flux gating mechanism of K2P channels, which results in an unusual voltage-dependent block of leak channels belonging to the TASK subfamily. 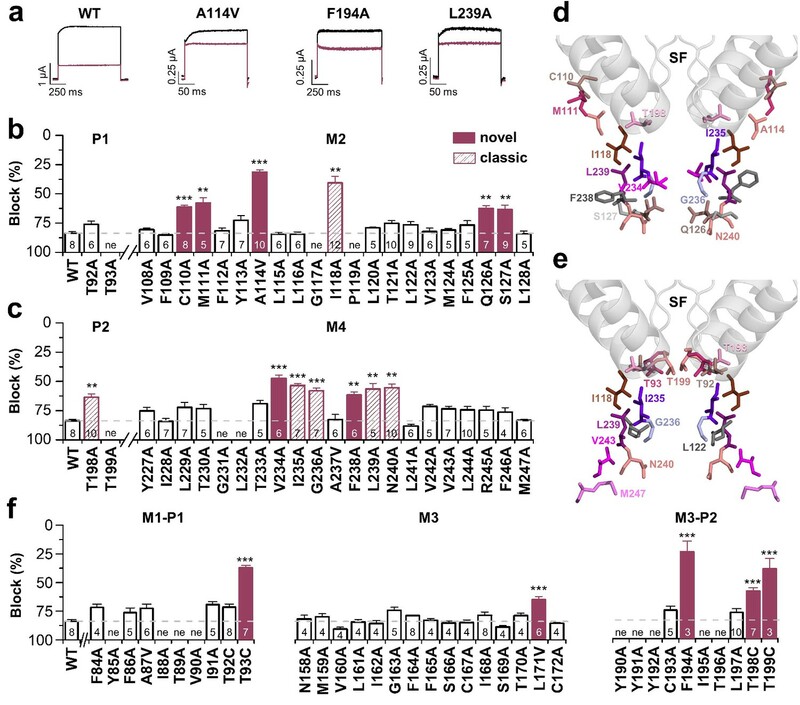 The new binding site and allosteric mechanism of inhibition provide structural and mechanistic insights into the gating of TASK channels and the basis for the drug design of a new class of potent blockers targeting specific types of K2P channels. Two-pore-domain potassium (K2P) channels are characterized by a unique structure and pharmacology. Crystallographic K2P channel structures revealed that the extracellular M1-P1 linkers of the dimeric channels form a large extracellular 'cap' (Brohawn et al., 2012; Miller and Long, 2012). TWIK-related acid-sensitive K+ (TASK) channels sense pH-variations in the physiological range and are modulated by volatile and intravenous anesthetics. TASK-like currents are found in various tissues and TASK channels are drug targets for many diseases, including diabetes (Pisani et al., 2016), obstructive sleep apnea (Kiper et al., 2015), pulmonary hypertension (Bohnen et al., 2017), and arrhythmias, like atrial fibrillation (Kiper et al., 2015; Liang et al., 2014; Limberg et al., 2011) or conduction disorders (Decher et al., 2011; Friedrich et al., 2014). As in other K+ channels, there is a lack of selective K2P channel blockers, since drugs preferentially bind to a conserved binding site located in the central cavity of potassium channels (Decher et al., 2004; Marzian et al., 2013). 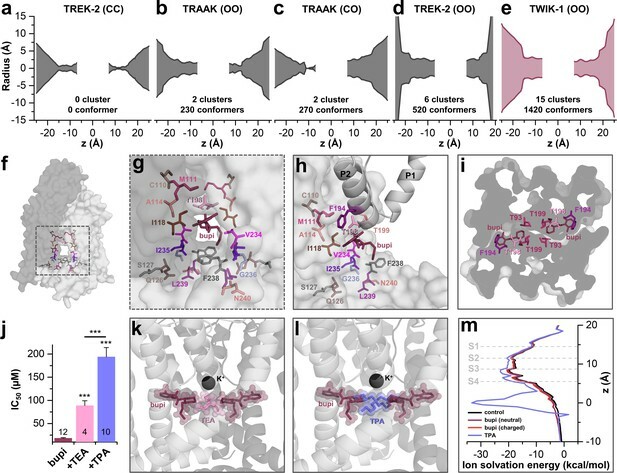 Thus, for the future rational drug design of specific K2P channel blockers it is crucial to identify binding sites outside the conserved water filled lipophilic central cavity and new allosteric -non pore plugging- mechanisms of channel inhibition like recently described for TREK channel blockers binding to the unique cap structure (Luo et al., 2017). Strikingly, the recently reported K2P channel crystal structures revealed putative binding sites outside the central cavity, the 'side fenestrations', which are openings towards the lipid bilayer of the membrane (Brohawn et al., 2012; Miller and Long, 2012). Accordingly, it was suggested that drugs and cellular lipids could bind to these locations (Miller and Long, 2012). In fact, norfluoxetine, the active metabolite of the antidepressant drug fluoxetine (Prozac), which blocks TREK channels, binds to these lateral fenestrations of TREK-2 (Dong et al., 2015). Despite recent advances in the understanding of the molecular pharmacology of TREK channel blockers (Dong et al., 2015; Luo et al., 2017) and activators (Lolicato et al., 2017), little is currently known about allosteric K2P channel block mechanisms. K2P channels were crystallized in two different states, the so called 'up' and 'down' state (Brohawn et al., 2014). The 'up' state is primarily achieved by a lateral movement of the M4 segments, resulting in the closure of the side fenestrations. Brohawn et al. proposed that the 'up' state reflects the conductive state of the channels (Brohawn et al., 2014). However, the fact that K2P channels were crystallized in both conformations, each with different potassium occupancies in the selectivity filter, suggested that there is not a tight coupling between the movement of the inner helices and the selectivity filter gate and that the channels can open from both conformations. Consistently, recent studies propose a gating model for TREK channels in which the channels can in fact open from the 'down' state, albeit opening preferentially occurs from the 'up' state (Brennecke and de Groot, 2018; McClenaghan et al., 2016). The gating at the selectivity filter itself occurs in a voltage-dependent manner with potassium ions as the voltage-sensing particles, resulting in increased outward currents upon depolarization (Schewe et al., 2016). In our current study, we found that the local anesthetic bupivacaine blocks TASK-1 in a voltage-dependent manner, which is a very unusual feature for a 'leak' channel blocker. 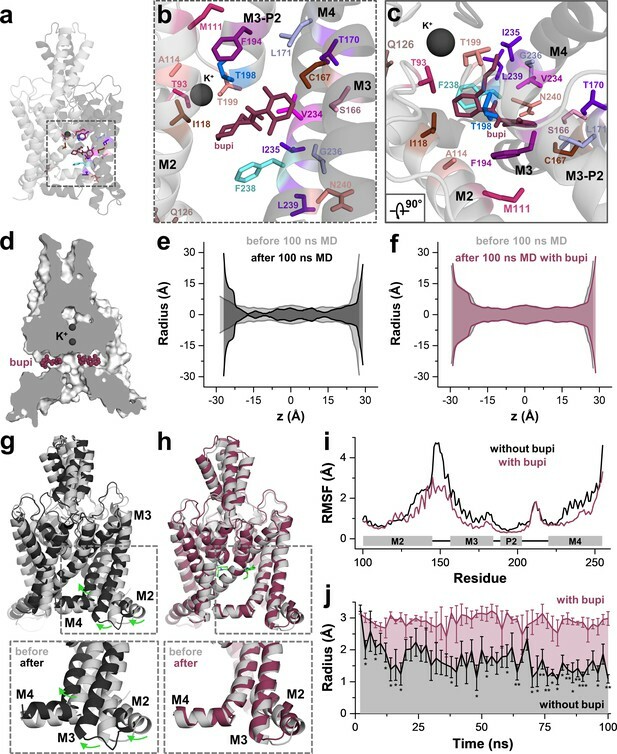 Using functional mutagenesis screens, in silico drug dockings and molecular dynamics (MD) simulations, we identified the binding site of this unusual K2P channel blocker, which is located in the side fenestrations of TASK-1, underneath the second pore helices. Strikingly, the drug is positioned so far laterally in the fenestrations that it does not cause a classical pore occlusion. Here we describe a novel allosteric block mechanism disrupting the K+-flux gating at the selectivity filter which results in TASK-1 channels with an unusual inward-rectification and accordingly a voltage-dependent inhibition. The newly identified binding site and allosteric mechanism of K+-flux gating inhibition described here will allow the rational drug design of potent and K2P subfamily specific blockers with specific kinetic features of inhibition. Initially we aimed to investigate the differences between potent TASK-1 blockers such as A1899 or A293 and the less potent local anesthetic bupivacaine. As a first step, we tested whether bupivacaine causes a stereoselective block of TASK-1. Using the Xenopus oocyte expression system both bupivacaine enantiomers and the racemic drug blocked TASK-1 outward currents with equal potencies (Figure 1—figure supplement 1a,b), similar to that previously described for the racemic drug (Leonoudakis et al., 1998) and the rate of inhibition was not significantly different for the enantiomers (Figure 1—figure supplement 1c). As there is no enantioselectivity for TASK-1 inhibition, the subsequent experiments were carried out with the racemic drug that is most commonly used. To test for a voltage-dependence of TASK-1 inhibition of the different compounds, we performed voltage-clamp experiments under symmetrical potassium concentrations. Surprisingly, bupivacaine preferentially blocks outward currents (Figure 1a–c), converting the linear current-voltage relationship of TASK-1 into an inwardly rectifying channel behavior (Figure 1a,b). This effect is caused by a voltage-dependent inhibition of TASK-1 (Figure 1c,d), a feature which has never been reported before for a K2P channel blocker. This blocking characteristic was not present for previously described TASK-1 channel blockers, such as A1899 (Figure 1f–i) and A293 (Figure 1k–n). Moreover, the voltage-dependence of block is only present for TASK-1 and TASK-3 channels (Figure 1p), but not for other K2P channels like TREK-1, TREK-2, TRAAK, TRESK or TASK-2 (Figure 1p and Figure 1—figure supplement 2). These data argue against a sole contribution of the protonation state and that only charged molecules cause the voltage-dependent inhibition. In addition, varying the intracellular pH in inside-out patches did not alter the TASK-3 sensitivity for bupivacaine, which further supports that the voltage-dependence of TASK-1 and TASK-3 inhibition is most likely not caused by charged bupivacaine molecules (Figure 1q,r). Voltage-dependent block of TASK-1 by impaired outward K+-flux gating. (a) Representative current traces of TASK-1 injected oocytes before (black) and after (purple) application of 500 µM bupivacaine, recorded in a symmetrical potassium solution (KD96) at potentials ranging from −70 mV to +70 mV. (b) Average IV-relationships recorded before and after drug application. (c) Analyses of the inhibition by bupivacaine at different voltages. (d) Relative block by bupivacaine comparing the inhibition at −70 and +70 mV, recorded under symmetrical potassium concentrations. (e) Mean current kinetics before (left) and after (right) application of 500 µM bupivacaine, illustrating the instantaneous (Iinstant) and K+-flux gated (IK+-flux) current component of the TASK current. Note, the lack of a K+-flux gated component after application of bupivacaine. (f–j) As in (a–e), but for A1899 or (k–o) for A293. (p) Relative block by bupivacaine comparing the inhibition of different K2P channels at −70 mV and +70 mV, recorded under symmetrical potassium concentrations. (q) Representative measurements of TASK-3 channels from inside-out macropatches showing the inhibition by increasing concentrations of bupivacaine at pH 5.0 (left) and pH 8.0 (right), recorded at a constant potential of +60 mV. (r) IC50 values of TASK-3 inhibition by bupivacaine at various intracellular pH levels. Data are represented as mean ± S.E.M.. The numbers of experiments (n) are indicated within brackets or as small insets in the respective bars. TASK-1 channels conduct with an instantaneous current component and a time-dependent activating component, most likely reflecting increased currents due to the K+-flux gating process at the selectivity filter (Figure 1e). Most importantly, in addition to the preferential block of outward currents by bupivacaine, the drug also significantly abrogates the time-dependent K+-flux-gated outward current component of TASK-1 (Figure 1e and Figure 1—figure supplement 3). This kinetic of inhibition of the outward currents is very unusual for K2P channel blockers, which normally just cause a 'shrinking' of the overall current amplitude without affecting channel kinetics (Putzke et al., 2007; Streit et al., 2011). Accordingly, this effect was not present for the TASK-1 blockers A1899 or A293 (Figure 1j,o and Figure 1—figure supplement 3). We have previously reported that TASK-1 inhibition by the open channel blocker A1899 is attenuated by extracellular potassium (Streit et al., 2011). In contrast, while increasing extracellular potassium concentration gradually decreased TASK-1 block by A1899, the inhibition of TASK-1 by bupivacaine was not affected (Figure 1—figure supplement 4). Summarizing, our data indicate that bupivacaine does not act as a classical open channel blocker and is utilizing a novel K2P channel inhibiting mechanism impairing voltage-dependent K+-flux gating. Thus, the binding site of bupivacaine is most likely different to that of TASK-1 open channel blockers, such as A1899. We have previously described the drug-binding site for A1899, the first highly potent blocker of TASK-1 channels. A1899 binds from the intracellular side to the central cavity of TASK-1 by interacting with several residues of the pore lining M2 and M4 segments and residues of the K+ channel signature sequence near the selectivity filter, ultimately resulting in a pore occlusion. In order to map the binding site of bupivacaine in TASK-1, we first performed a systematic alanine mutagenesis screen of the M2 and M4 segments and the threonine residues of the P1 and P2 loops, determining the inhibition by bupivacaine in the oocyte expression system (Figure 2). We identified several residues for which the bupivacaine sensitivity was diminished by mutations at the binding site that was previously identified for A1899, including I118 in M2 and I235, G236, L239 and N240 in M4 (classic 'hits') (Figure 2a–c). However, we also identified novel 'hits' including C110A, M111A, A114V, Q126A and S127A in the M2 segment, as well as V234A and F238A in the M4 segment (Figure 2a–c). In the pore signature sequence, we identified T198 of the second pore loop (P2) to be relevant for drug block, while the homologous mutation (T92A) in the first pore loop did not affect bupivacaine sensitivity (Figure 2b,c). Next, we used a TASK-1 homology model based on the down state of TRAAK to make further predictions and to illustrate the residues of the bupivacaine binding site (Figure 2d) which is clearly different to that of A1899 (Figure 2e). The bupivacaine binding site is more 'V'-like shaped, as the compound appears to interact with residues that are in the upper sideward part of the cavity, such as C110, M111 and A114 (Figure 2d). These data suggest that bupivacaine might be located laterally underneath the pore helices, in the side fenestrations that were previously described for other K2P channels. Therefore we alanine scanned the M1-P1 and the M3-P2 pore helices and the M3 segment, which are, according to the crystal structures of other K2P channels, located at the outer entry to the lateral fenestrations. Here we identified a strong reduction of the bupivacaine sensitivity by mutations of the second threonines of the pore signature sequence (T93C, T199C) in P1 and P2 (Figure 2f), residues previously described to alter the K+-flux gating of K2P channels (Schewe et al., 2016). Given the two-fold rhomboid symmetry of K2P channels, only the second pore helices are expected to be located above the side fenestrations (Figure 3—figure supplement 1). Strikingly, we only identified strong sensitivity changes for mutations located in the P2 pore helix (F194A, T198C) (Figure 2f). In addition, we also observed weak but significant reduction of the bupivacaine sensitivity for the L171V mutant in the M3 segment (Figure 2f), which is expected to be located at the entry to the lateral fenestrations. Bupivacaine utilizes a novel binding site in TASK-1. (a) Representative current traces of wild-type TASK-1 (WT) and mutant channels expressed in oocytes before (black) and after (purple) application of 500 µM bupivacaine. (b) Percentage of inhibition by 500 µM bupivacaine of wild-type TASK-1 and alanine mutants of the P1 signature sequence, the M2 segment and (c) the P2 signature sequence and the M4 segment. Residues identified as drug-binding sites ('hits'), which were previously also reported for the binding site of the open channel blocker A1899 ('classical'), are illustrated as striated bars and the 'hits' of the novel bupivacaine binding site are depicted as filled bars ('novel'). (d) Amino acids involved in binding of bupivacaine and (e) the respective A1899 binding mode, according to Ramírez et al. (2017), both illustrated in a TRAAK-OO (PDB ID: 3UM7) based TASK-1 homology model. SF indicates the selectivity filter. (f) Analyses of the percentage of inhibition by 500 µM bupivacaine for TASK-1 alanine mutants of the M1-P1, M3 and M3-P2 segments. ne, not expressed. Data are represented as mean ± S.E.M.. The numbers of experiments (n) are indicated within the respective bars. As there is no crystal structure of TASK-1 reported so far, we generated different TASK-1 homology models based on the available crystal structures, namely TREK-2 with both fenestrations closed (TREK-2-CC), TRAAK with both (TRAAK-OO) and one fenestration open (TRAAK-CO), TREK-2 with both fenestrations opened (TREK-2-OO), as well as TWIK-1 that has two wide side fenestrations (TWIK-1-OO). Next, we docked bupivacaine into the different models and analyzed the docking solutions towards the interaction with the residues we identified in our alanine mutagenesis screen. Here we noted that the best overlap with our functional data is given for docking solutions with bupivacaine located in the side fenestrations of the different TASK-1 homology models. Here, we noted that with gradually increasing the diameter of the side fenestration (Figure 3a–e) the number of bupivacaine docking solutions (conformers) in the fenestrations and the number of clusters in the fenestrations strongly increased (Figure 3a–e). Genes encoding the crystallized TWIK and TREK/TRAAK channels are paralogs of KCNK3 encoding TASK-1 and within these channels TWIK-1 is the closest relative to TASK-1 with a sequence identity of 26.1%. These genetic lines of evidence are further supported by the fact that TWIK-1 and TASK-1 share functional similarities, that is they change their permeability upon extracellular acidification and they form heterodimeric channels (Ma et al., 2012; Plant et al., 2012). Strikingly, the TWIK-1 based homology model showed by far the most significant clusters (15) and conformers (1420) in the side fenestrations (Figure 3e). In addition, analyzing the free energy of the docking solutions (MM-GBSA) (Ramírez et al., 2017) that fit the best to our functional data, revealed that the most stable docking solutions are generated using the TWIK-based TASK-1 homology model. Thus, we propose that TASK-1 channels are likely to exhibit large side fenestrations similar as other K2P channels. Analyzing the TWIK-1 based TASK-1 homology model that lead to the best docking solutions, the residues we identified in the alanine scan line the side fenestrations (Figure 3f). In the best docking solution, bupivacaine is located in the side fenestrations (Figure 3g) located underneath the M3-P2 pore helices (Figure 3h and Figure 3—figure supplement 1). The 'classical' drug-binding site residues I118 of the M2 segment and I235 of the M4 segment have an intermediate location between the central cavity and the side fenestrations and also interact with bupivacaine (Figure 3g–h). Remarkably, the 'atypical' and novel residues identified, with C110, M111 and A114 of M2, F194, T198 and T199 of the M3-P2 linker and V234 and F238 of M4, face towards the side fenestrations and the drug (Figure 3g,h). The drug is located in a thin sewer connecting the side fenestration with the central cavity, explaining the preferential interaction with the second of the two pore helices, as this is positioned directly above the drug (Figure 3i and Figure 3—figure supplement 1). TASK-1 channels are fenestrated providing the bupivacaine binding site. (a–e) Hole analyses illustrating the diameter of the side fenestrations in different TASK-1 homology models together with the number of docking solutions (conformers) located in the fenestrations and the number of significant clusters formed by the different conformers. 'C' indicates a closed and 'O' an open fenestration. The TASK-1 homology models were based (a) on TREK-2-CC (PDB ID: 4BW5), (b) TRAAK-OO (PDB ID: 3UM7), (c) TRAAK-CO (PDB ID: 4I9W), (d) TREK-2-OO (PDB ID: 4XDK), and (e) TWIK-1-OO (PDB ID: 3UMK). (f) TASK-1 homology model based on TWIK-1 illustrating the amino acid 'hits' in the M2 and M4 segments identified by alanine scanning. Note that the 'hits' primarily line the side fenestrations. (g) Enlargement of (f) with bupivacaine located in the side fenestrations illustrating the involvement of the M2 and M4 hits. (h) View showing the localization of bupivacaine under the second pore helix together with the respective M2 and M4 'hits'. (i) Cross section view from the bottom of the TASK-1 model visualizing the two side fenestrations and the localization of bupivacaine together with the 'hit' residues of the pore helices. (j) IC50 of bupivacaine on TASK-3 channels recorded in inside-out macropatch clamp experiments alone or in the presence of TEA or TPA. (k) Binding mode of bupivacaine together with that of TEA and (l) TPA, respectively. (m) Ion solvation free energy profile for potassium ions in the TWIK-1 based TASK-1 pore homology model alone (control), in the presence of neutral or charged bupivacaine or TPA. TASK-3 channels are blocked by bupivacaine with the similar mechanism (Figure 1p) and sensitivity (Figure 3—figure supplement 2) as TASK-1 channels, which is in line with our observation that the binding site is fully conserved between these two closely related channels (Figure 3—figure supplement 2a). As TASK-3 channels show a very pronounced functional expression (Rinné et al., 2015), we performed inside-out macropatch clamp experiments using this channel. Here we probed for a competition of bupivacaine, which is located in the side fenestrations, with the pore blocking quaternary ammonium compounds TEA and TPA (Piechotta et al., 2011). Consistent with the binding site of bupivacaine we have proposed here, the smaller TEA causes a less pronounced competition and increase in IC50 than TPA, as the binding sites only partially overlap (Figure 3j,k), while TPA is larger and protrudes up to the entry of the side fenestrations (Figure 3j,l). This data is in line with our final docking solution of bupivacaine located in the side fenestrations, at a position that does not allow a physical occlusion of the selectivity filter or prevention of the passage of potassium ions through the inner cavity. Quaternary ammonium compounds do however, in addition to a spatial pore plugging mechanism, also disturb the ion passage by an electrostatic interaction with the permeating ion (Faraldo-Gómez et al., 2007; Kutluay et al., 2005). Here we calculated the ion solvation free energy profiles which show that TPA induces an ion solvation free energy barrier due to its charge, an effect that was however not present for neutral and charged bupivacaine (Figure 3m). These data indicate that bupivacaine does not disrupt K+ conductance due to an electrostatic repulsion effect. In addition, it supports our hypothesis that it is not the charged bupivacaine causing the voltage-dependence of block and that an allosteric inhibition mechanism causes the untypical K2P channel inhibition. Next, we performed 100 ns of MD simulations with bupivacaine located in the binding site of the side fenestration, analyzing the number of contacts with the key residues identified in our alanine scanning approach. These simulations revealed a stable binding of bupivacaine to the side fenestration and confirmed almost all interactions with the residues that we identified in our functional screen. Only for the residues C110 in the upper and S127 in the lower M2 segment, we observed no contacts with the drug during the MD simulations, as these were not perfectly facing towards the bupivacaine-binding site. These 'hits' were considered as false positives that might have allosterically influenced drug binding or inhibition, as they are in close proximity to the compound and yet do not have direct contact. Notably, we found a high number of contacts with F194, T198 and T199 that are located in the second pore helix (Figure 4a–c). As T199 determines the ion occupancy of the selectivity filter in K2P channels (Schewe et al., 2016), an interaction with this residue and the second pore helix might allosterically interfere with K+ occupancy and conductance of the selectivity filter. In addition, we also observed contacts during the MD simulations with residues of the M3 segment, including S166, C167, T170 and L171 (Figure 4b,c), which is consistent with the significant changes in sensitivity we observed for the M3 mutations C167D, L171V and the S116A/C167A/T170A triple mutation (Figure 2f and Figure 4—figure supplement 1). The data further support that bupivacaine is not occluding the central cavity and is located in the side fenestrations, interacting with residues of the second pore helix and that bupivacaine is positioned so far laterally that it is able to form weak contacts with residues of the M3 segment. MD simulations - binding in the fenestrations prevents fenestration gating. (a) Side view on a TWIK-1 based TASK-1 homology model with bupivacaine located in the side fenestrations after 100 ns MD simulations. (b–c) Zoom-ins illustrating 'hit' residues of the alanine scan, which were confirmed in the MD simulations to have contacts with bupivacaine. (d) TASK-1 homology model based on TWIK-1 depicting bupivacaine within the two side fenestrations. (e) Hole analysis before (light gray) and after (gray) 100 ns MD simulations revealing a collapse of the side fenestrations when the channels move to the 'up' state. (f) Hole analysis as in (e), but in the presence of bupivacaine (purple), which prevents the movement to the 'up' state and the concomitant collapse of the fenestrations. (g) TASK-1 homology model in the absence of bupivacaine before (gray) and after 100 ns of MD simulations (black). Green arrows indicate the movement of the M2, M3 and M4 segments causing the 'down' to 'up' transition. (h) TASK-1 homology model in the presence of bupivacaine (green) before (gray) and after (purple) 100 ns, illustrating the lack of the M2, M3 and M4 movements. (i) Root-mean-square fluctuations (RMSF) calculated for the alpha carbons of the M2, M3, P2 and M4 segments in the absence and presence of bupivacaine. (j) Quantitative analysis of the bottleneck radius of the side fenestrations over the time course of 100 ns MD simulations (n = 4) in the absence (gray) and presence (purple) of bupivacaine. Data are represented as mean ± S.E.M. Next, we used a complementary approach utilizing induced fit docking experiments with four different TASK-1 homology models (Material and methods and Figure 4—figure supplement 2). Here, the highest success rate of the induced fit dockings were again obtained in a TASK-1 model based on TWIK-1-OO (Figure 4—figure supplement 2a). Given the highest success rate in the TWIK-1-based homology model and that TWIK-1 is the closest relative of the crystallized K2P channels, we selected the pose with the lowest IFD energy that is, as described above, also consistent with the TEA versus TPA competition experiments. The induced fit docking solution in the TWIK-OO based TASK-1 homology model is very similar to the one obtained by our classical docking approach (Figure 4—figure supplement 2b–c), confirming the binding site we have proposed above. Similar as previously described for TWIK-1 (Jorgensen et al., 2016), TASK-1 channels converted into the 'up' state during MD simulations (100 ns), resulting in a closure of the side fenestrations (Figure 4e,j). Strikingly, this conversion to the 'up' state was prevented during four replicates of 100 ns MD simulations, when charged or uncharged bupivacaine was located in the binding site of the fenestrations (Figure 4d,f,j and Figure 4—figure supplement 3). This transition of the channel from the 'down' to 'up' state, which exclusively occurs in the absence of bupivacaine, is caused by a coordinated movement of the M2, M3 and M4 segments (Figure 4g,h and Video 1), similar as previously reported for 100 ns MD simulations of TREK-2 channels (Dong et al., 2015). These movements in the absence of bupivacaine are also reflected by an analysis of the root-mean-square fluctuations (RMSF) (Figure 4i), revealing that the M2-M3 linker and the M4 segment are much more flexible during MD simulations in the absence of bupivacaine. As these movements are expected to concomitantly close the side fenestrations, we have quantitatively analyzed this transition, monitoring the bottleneck diameter of the fenestration in MD simulations over time (Figure 4j). Here the bottleneck radius of the fenestrations quickly and significantly decreases in the absence of bupivacaine, while bupivacaine stabilizes the bottleneck radius of the side fenestrations to remain at about 3 Å over the whole time period of the 100 ns MD simulations (Figure 4j). Thus, bupivacaine prevents closure of the side fenestrations and the conversion of the channel to the 'up' state. However, whether TASK-1 channels gate in a similar way as TREK-1 channels and whether they physiologically convert into an 'up'-state-like conformation currently remains unknown. Thus, it also remains an open question whether effects of bupivacaine on the architecture of the fenestrations contribute to the allosteric mechanism of inhibition. MD simulation of the TASK-1 homology model with and without bupivacaine. TASK-1 homology model in the absence (left) and the presence (right) of bupivacaine during 100 ns of MD simulations. Note the lack of major M2, M3 and M4 re-arrangements in the presence of bupivacaine (right). Next, we performed inside-out single channel measurements of TASK-3 to support the inhibition mechanism proposed above. TASK-3 has longer open times and a higher single channel conductance than TASK-1 and thus is more suitable for an analyses of the inhibition mechanism on a single channel level. Similar as in the whole-cell recordings, bupivacaine caused a preferential inhibition of outwardly-directed single channel events when applied form the intracellular side of the membrane (Figure 5a). In a concentration that reduced the open probability by approximately fifty percent (Figure 5c), bupivacaine did not alter the single channel conductance (Figure 5b) and did not shorten the mean open time (Figure 5d,e) or burst duration (Figure 5—figure supplement 1), effects that are typically observed for open channel blockers. In contrast, bupivacaine stabilized the closed state of the channel resulting in longer closed times (Figure 5f,g). In contrast, TEA, which is a classical voltage-dependent blocker of Kv channels and an open channel blocker of K2P channels (Piechotta et al., 2011), reduced the open times of TASK-3 (Figure 5h–j) and also caused a mild reduction in conductivity of the channels (Figure 5k,l). Thus, the mechanism of bupivacaine inhibition is clearly different to that of a classical open channel blocker, as the drug causes an isolated stabilization of the closed state, consistent with a prevention of voltage-dependent K+-flux gating, which would normally allow a higher conductivity at depolarized membrane potentials. Bupivacaine stabilizes the closed state of TASK channels. (a) Representative inside-out single channel recordings of TASK-3 at +140 and −140 mV before (left, black) and after (right, purple) application of 100 µM bupivacaine and (b) amplitude histogram of the events recorded at +140 mV (n = 4). (c) Change in relative open probability (NPo) by 100 µM bupivacaine. (d) Graphical illustration of the open times before and (e) after drug application (n = 4). (f) Analyses of the closed time before and (g) after application of 100 µM bupivacaine (n = 4). (h) Representative inside-out single channel recordings of TASK-3 at +140 mV before (up, black) and after (down, light pink) application of 100 mM TEA and (i) representative illustration of the open times of a TASK-3 containing patch before and after drug application. (j) Relative change in open times by 100 mM TEA (n = 3). (k) Amplitude histogram of the events recorded at +140 mV (n = 3) and (l) the respective analyses of the relative change in single channel amplitude before (black) and after (light pink) application of 100 mM TEA. Data are represented as mean ± S.E.M.. The numbers of experiments (n) are indicated within the respective bars. The binding site and inhibition mechanism of bupivacaine is different to that of pore plugging compounds. Bupivacaine is located laterally in the side fenestrations of TASK-1 channels and interacts with residues of the pore helix, the M2, M3 and M4 segments, while pore blockers such as A1899 are located in the central cavity to prevent K+ permeation (Figure 6a,b). As bupivacaine located in the side fenestration interferes with the voltage-dependent K+-flux gating, the increased outward currents that are physiologically present upon depolarization are impaired, resulting in a lack of outward rectification and a preferential inhibition of outward currents (Figure 6c). In conclusion, the weak voltage-dependent inhibition of TASK channels that we describe here, results from a new allosteric inhibition mechanism, which operates by preventing the voltage-dependent K+-flux gating. A novel allosteric inhibition mechanism interferes with the voltage-dependent activation of TASK channels. (a) Illustration of the bupivacaine binding mode in the side fenestrations (left), preventing K+-flux gating, which requires a K+ filled selectivity filter (right cartoon). The closed state or collapsed selectivity filter is indicated by one potassium ion (black dot). (b) A1899 located in the central cavity (left) is binding in an 'anchor'-shaped like structure which occludes the pore and thus prevents K+ permeation (right cartoon). Here the K+ occupancy of the selectivity filter is not disturbed (illustrated by two black dots in the selectivity filter). (c) Schematic illustration of the proposed gating model of TASK-1. The upper panel illustrates the selectivity filter in the open state and the lower panel the TASK channel. 'C' indicates the closed state conformation of the selectivity filter (one potassium ion located before the collapsed filter) and 'O' indicates the open state with a K+ filled selectivity filter (here two potassium ions illustrated). SF indicates the selectivity filter and F the side fenestrations. The voltage-dependent (ΔV) opening of the selectivity filter gate (K+-flux gating) preferentially results in the typical outwardly rectifying K+ currents. The presence of bupivacaine in the side fenestrations prevents the voltage-dependent K+-flux gating, resulting in reduced outward currents at depolarized potentials and thus a voltage-dependent inhibition. Utilizing systematic alanine scanning mutagenesis, in silico docking experiments and MD simulations, combined with voltage-clamp and single channel measurements, we identified the molecular basis for a novel inhibition mechanism for K2P channels, which functions in an allosteric and voltage-dependent manner. While for TASK channels no crystallographic structures have been reported so far, the data describing the bupivacaine binding site, together with the allosteric inhibition mechanism we present here, allows valuable predictions regarding the structure of these channels. We propose that TASK-1 channels must have lateral fenestrations large enough to accommodate drugs and that binding of bupivacaine in the fenestrations allosterically prevents the voltage-dependent K+ flux gating. While we identified specific residues to exclusively affect block by bupivacaine and not A1899, there is still a partial overlap to the binding site of the open channel blocker A1899 (i.e. residues I118, I235, G236, L239 and N240). This apparent discrepancy can be explained by the fact that many of the A1899 binding residues (Streit et al., 2011) are not strictly 'pore facing' and are likely to be also accessible from the side fenestrations (Ramírez et al., 2017). In general, one has to consider that reduced inhibition of a mutant does not necessarily imply binding at the respective site, as it is conceivable that the mutation affects the block allosterically. This caveat has to be specifically considered when studying mutations that might simultaneously interfere with drug binding and the gating mechanism, like in the case of T199C (Schewe et al., 2016). However, the fact that we conclusively mapped a binding site that includes a large set of residues and that this site was confirmed by in silico dockings, MD simulations and TEA/TPA competition experiments, must lead to the conclusion that we have identified the most likely binding mode for bupivacaine. TASK channels provide two side fenestrations as putative allosteric binding sites for the most likely channel inhibition we describe here. The slope factor of the bupivacaine dose-response curve does not indicate a cooperativity of inhibition, suggesting that binding in one of the fenestrations does not facilitate the binding in the second. Thus, it is possible that binding to one of the fenestrations is sufficient to cause channel inhibition or that both sites are occupied by the drug, but channel inhibition is achieved in an additive and non-cooperative manner. Bupivacaine located in the side fenestrations interacts with residues of the second pore helix. Noteworthy, mutations homologous to T199C of P2 were reported to alter K+-flux gating of K2P channels by changing the ion occupancy in the selectivity filter (Schewe et al., 2016). Thus, bupivacaine interacting with residues of the second pore helix (F194, T198 and T199) might interfere with the K+-flux gating by disturbing the initiation of the proper K+ occupancy in the selectivity filter. 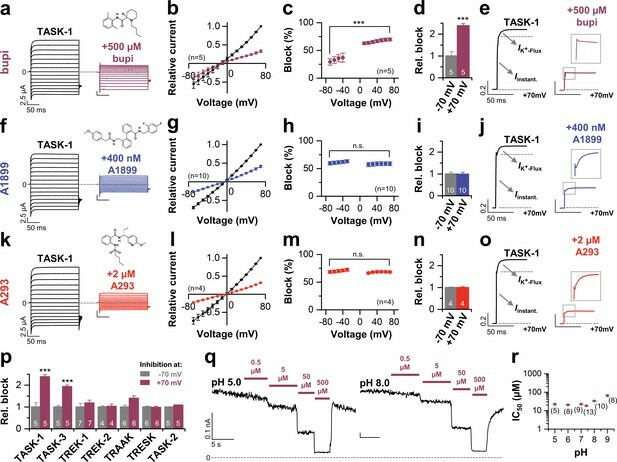 In this context, it might be possible that the ability of bupivacaine to selectively induce a voltage-dependent inhibition of TASK-1 and TASK-3 reflects that channels of this K2P channel subfamily seem to undergo a distinct gating mechanism, which is disrupted by the drug. This is supported by the fact that TASK-1/-3 channels do not show the typical Rb+-dependent gating, with strongly increased conductivity by Rb+, as the other K+-flux gated K2P channels (Schewe et al., 2016). The local anesthetic bupivacaine is a low potent multi-channel blocking drug, affecting sodium and potassium channels. However, utilizing this compound we were able to identify a novel drug-binding site and allosteric inhibition mechanism, providing the molecular basis for the rational drug design of potent K2P channel modulators with distinct biophysical features. 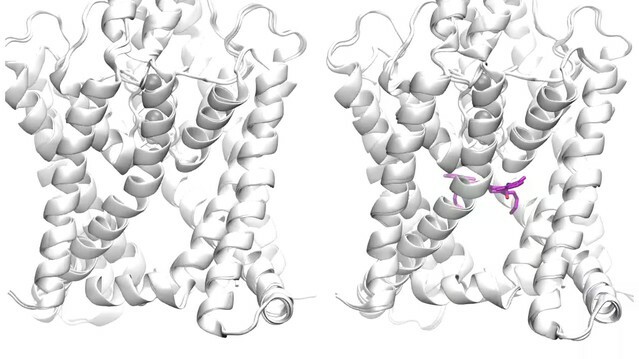 The binding site in the side fenestration is fully conserved for TASK-1 and TASK-3, while it is distinct to that of other K2P channels. Thus, the fenestrations provide the molecular basis for novel K2P channel subtype specific blockers and a new principle of action that might be beneficial for future drugs targeting diseases of excitable tissue, like in arrhythmias, epilepsies and diabetes. Oocytes were obtained from anesthetized Xenopus laevis frogs as described previously (Streit et al., 2011) and incubated in OR2 solution containing (in mM): NaCl 82.5, KCl 2, MgCl2 1, HEPES 5 (pH 7.5), supplemented with 2 mg/ml collagenase II (Sigma) to remove residual connective tissue. Subsequently, oocytes were stored at 18°C in ND96 solution containing (in mM): NaCl 96, KCl 2, CaCl2 1.8, MgCl2 1, HEPES 5 (pH 7.5), supplemented with 50 mg/l gentamycine, 274 mg/l sodium pyruvate and 88 mg/l theophylline. Human TASK-1 channels were subcloned into a pSGEM or pBF1 vector and point mutations were introduced using the QuikChange site-directed mutagenesis kit (Stratagene). Human TASK-3, TREK-2, TRAAK, TRESK, TASK-2 and TREK-1 channel constructs were used in an oocyte expression vector (pSGEM or pBF1). cDNA was linearized with NheI or MluI and cRNA was synthesized with mMESSAGE mMACHINE-Kit (Ambion). The quality of cRNA was tested using gel electrophoresis and cRNA was quantified with the NanoDrop 2000 UV-Vis spectrophotometer (Thermo Scientific). Oocytes were each injected with 50 nl of cRNA. All TEVC recordings were performed at room temperature (20–22°C) with a TurboTEC 10 CD (npi) amplifier and a Digidata 1200 Series (Axon Instruments) as A/D converter. Micropipettes were made from borosilicate glass capillaries GB 150TF-8P (Science Products) and pulled with a DMZ-Universal Puller (Zeitz). Recording pipettes had a resistance of 0.5–1.2 MΩ and were filled with 3 M KCl solution. ND96 or KD96 were used as recording solutions. KD96 solution contained (in mM): NaCl 2, KCl 96, CaCl2 1.8, MgCl2 1, HEPES 5 (pH 7.5). Block was analyzed with voltage steps from a holding potential of −80 mV. A first test pulse to 0 mV of 1 s duration was followed by a repolarizing step to −80 mV for 1 s, directly followed by another 1 s test pulse to +40 mV. The sweep time interval was 10 s. The IV relationships in ND96 solution were measured from a holding potential of −80 mV (in KD96 from a holding potential of 0 mV) with voltage steps ranging from −70 to +70 mV with 10 mV increments for 200 ms. Data were acquired with Clampex 10 (Molecular Devices), analyzed with Clampfit 10 (Molecular Devices) and Origin 2016 (OriginLab Corporation). Macropatch recordings from Xenopus laevis oocytes in inside-out configuration under voltage-clamp conditions were made at room temperature 72–120 hr after injection of 50 nl channel specific cRNA. Thick-walled borosilicate glass pipettes had resistances of 0.3–0.9 MΩ (tip diameter of 5–15 µm) and were filled with extracellular solution containing (in mM): KCl 4, NMDG 116, HEPES 10 and CaCl2 3.6 (pH was adjusted to 7.4 with KOH/HCl). Bath solution was applied to the cytoplasmic side of excised macropatches via a gravity flow multi-barrel application system and had the following composition (in mM): KCl 120, HEPES 10, EGTA 2 and Pyrophosphate 1. The various appropriate pH levels (pH 5.0, pH 9.0) were adjusted with KOH/HCl. Macroscopic currents from hTASK-3 channels (NM_001282534) were acquired with an EPC10 amplifier (HEKA electronics, Lamprecht, Germany) at a continuous voltage of +60 mV, sampled at 10 kHz and filtered analogue to 3 kHz (−3 dB). Tetrapentylammonium chloride (TPA-Cl) and bupivacaine hydrochloride monohydrate were purchased from Sigma-Aldrich and stored as stock solutions (100 mM) at −20°C. The drugs were diluted in intracellular bath solution to final concentrations prior to each measurement. For data analysis Igor pro (WaveMetrics Inc, Portland, USA) software was used. The relative steady-state level of blockage for bupivacaine was fitted with the Hill equation: base + (max - base)/[xhalf/x)H], where base = inhibited (zero) current, max = maximum current, x = ligand concentration, xhalf = value of concentration for half-maximal occupancy of the ligand binding site and H = Hill coefficient. Single channel patch clamp recordings in the inside-out configuration using Xenopus oocytes were performed similar as previously described (Rinné et al., 2015). Therefore, the vitelline membranes were manually removed from the oocytes after shrinkage by adding mannitol to the bath solution. All experiments were conducted at room temperature 24–48 hr after cRNA (0.005 ng hTASK-3 per oocyte) injection. Borosilicate glass capillaries GB 150TF-8P (Science Products) were pulled with a DMZ-Universal Puller (Zeitz) and had resistances of 4–6 MΩ. Capillaries were filled with bath solution containing (in mM): KCl 140, HEPES 5, EGTA 1 (pH 7.4 adjusted with KOH/HCl). Bupivacaine and tetraethylammonium chloride (TEA-Cl) were added to the bath solution before each measurement, having final concentrations of 100 µM and 100 mM, respectively. Single channel currents were recorded with an Axopatch 200B amplifier (Axon Instruments), a Digidata 1550B A/D converter (Axon Instruments) and pClamp10 software (Axon Instruments) and were sampled at 15 kHz with the analog filter set to 2 kHz. Voltage pulses were applied from 0 mV (holding potential) to +140 mV and/or −140 mV for 1 s with an interpulse interval of 8 s. Data were analyzed with ClampFit10 and Origin 2016 (OriginLab Corporation). All drugs were dissolved in DMSO, aliquoted, stored at −20°C or room temperature and added to the external solution (ND96 or KD96) just before the recordings. Stock solutions had a concentration of 125 mM (R/S-bupivacaine), 125 mM (R-bupivacaine), 125 mM (S-bupivacaine), 10 mM (A293) and 10 mM (A1899). The IC50 was determined from Hill plots using four concentrations for each construct. Final DMSO concentration did not exceed 0.001%. As previously described (Ramírez et al., 2017) five different homology models were generated for human TASK-1 (UniProtKB accession number: O14649) based on TREK-2 with the two fenestrations closed (TREK-2-CC, PDB ID: 4BW5), TREK-2 with both fenestrations opened (TREK-2-OO, PDB ID: 4XDK), TRAAK with two fenestrations opened (TRAAK-OO, PDB ID: 3UM7), TRAAK with one fenestration closed and the other open (TRAAK-CO, PDB ID: 4I9W) and TWIK-1 with two fenestrations opened (TWIK-1-OO, PDB ID: 3UMK). Side chain modeling was performed with the Biased Probability Monte Carlo (BPMC) method (Abagyan and Totrov, 1994). The models were embedded into a pre-equilibrated membrane in a periodic boundary condition box with water molecules and ions. Each system was subjected to minimization and 10 ns molecular dynamics (MD) simulation, as previously described (Ramírez et al., 2017). To resolve the fenestrations dimensions of the TASK-1 structures HOLE (Smart et al., 1996) was used in the last frame of the MD simulations. For each MD simulation, a total of 20 structures were saved (one snapshot each 0.5 ns) to perform the docking using the Glide v.7.4 module of the Schrödinger suite (Friesner et al., 2004). All TASK-1 models were selected as docking targets. Ten conformers of bupivacaine were generated using ConfGen (Watts et al., 2010) to enhance the sampling of the ligand. One grid was generated in each fenestration, another grid in the central cavity and a fourth grid that includes the two fenestrations and the central cavity. Standard precision mode (SP) of Glide was used for docking and 8000 bupivacaine poses per TASK-1 model were obtained (100 poses per grid in each frame, 20 frames per model), except for TASK-1 based on TREK-2-CC, where only 2000 poses were obtained because fenestrations are closed. The Conformer Cluster script (available in www.schrodinger.com/scriptcenter/) was used to process and to organize the poses. The clustering was done by RMSD (≤2 Å) considering only the heavy atoms of the bupivacaine. Poses within significant clusters (Bottegoni et al., 2006) were chosen for calculation of the experimental interaction score (EIS), for which a score for each interaction between bupivacaine and the residues of the binding site for each pose was assigned, as previously described (Ramírez et al., 2017). For TPA and TEA molecular docking, a TASK-1 model based on TWIK-1 was aligned with the KcsA crystal structure (PDB ID: 1J95) (Zhou et al., 2001) and a docking procedure similar to that reported for channel TREK-1 was performed (Piechotta et al., 2011). Schrödinger’s Induced Fit Docking (IFD) (Sherman et al., 2006) was performed using Glide v.7.4 (Friesner et al., 2004) with the standard precision mode. Here, for each pose, a Prime structure prediction adjusts the ligand by reorienting nearby side chains. First we generated 20 different starting structures (seeds) for each homology model, by taking a frame from an MD simulation every 0.5 ns. We performed induced fit dockings using the 20 different starting structures for each homology model. This reflects 40 or only 20 induced fit dockings per homology model if only one fenestration is in the open state. For the initial ligand sampling, docking grid was centered on a selection of the experimental hits residues of each fenestration. A van der Waals radii of 0.5 Å for protein and ligand was used and 20 poses were generated for each structure per opened fenestration. Residues within 5 Å of each docking solution were minimized using Prime module of Schrödinger suite (Prime, version 4.7, Schrödinger, LLC, New York, NY, 2017). Subsequently, using the poses that survived this first round of induced fit dockings, a redocking without vdW scaling was carried out and the best structure according to the induced fit docking score was generated. Where T is the trajectory time over which the RMSF is calculated, t is the reference time (the beginning of the MD simulation), r is the position of residue i; ri is the position of atoms in residue i after superposition on the reference, and the angle brackets indicate that the average of the square distance is taken over the selection of atoms in the residue. Ion solvation energy was calculated using the Adaptive Poisson-Boltzmann Solver (APBS) software (Callenberg et al., 2010) to calculate the Poisson-Boltzmann equation in an APBSmem interface (Baker et al., 2001). A TASK-1 model based on TWIK-1 was used for the continuum electrostatic calculations. The selectivity filter of the channel was aligned to the Z axis. The parameters used are summarized in Supplementary file 1. Every dataset was tested with a Shapiro-Wilk test for normality. Equality of variances was tested using either a parametric or non-parametric Levene's test. In case of similar variances, significance was probed using either a paired or unpaired Student's t-test and for not normally distributed data, a non-parametric Mann-Whitney U-test and a Wilcoxon signed-rank test for paired analyses was used, respectively. If the variances of the groups were different, significance was probed using either Welch’s t-test and for not normally distributed data Mood’s median test was used. Experiments were non-randomized and non-blinded and no pre-specified sample size was estimated. All data are presented as mean ± S.E.M. and all experiments were repeated from N = 2–5 different batches (biological replicates). The number of experiments (n) as technical replicates are indicated in the subpanels of the Figures. Significances are indicated with *, p < 0.05; **, p < 0.01; ***, p < 0.001 in the Figures and the statistical method applied is provided in the respective Figure legend. Journal of the American Heart Association 6:e006465. Journal of Chemical Information and Modeling 46:852–862. The Journal of Biological Chemistry 279:394–400. Cellular Physiology and Biochemistry 28:77–86. Journal of Molecular Biology 365:649–662. Journal of Medicinal Chemistry 47:1739–1749. The Journal of Physical Chemistry B 105:6474–6487. Pflügers Archiv - European Journal of Physiology 467:1081–1090. The Journal of Neuroscience 18:868–877. Journal of Molecular and Cellular Cardiology 67:69–76. Cellular Physiology and Biochemistry 28:613–624. Journal of Biological Chemistry 287:37145–37153. The Journal of General Physiology 147:497–505. Journal of Molecular and Cellular Cardiology 81:71–80. Journal of Medicinal Chemistry 49:534–553. Journal of Biological Chemistry 286:13977–13984. Journal of Chemical Information and Modeling 50:534–546. Thank you for sending your article entitled "The molecular basis for an allosteric inhibition of K+-flux gating in K2P channels" for peer review at eLife. Your article is being evaluated by two peer reviewers, and the evaluation is being overseen by a Reviewing Editor and Richard Aldrich as the Senior Editor. The manuscript by Rinné et al. reports the discovery of the binding site of the local anesthetics bupivacaine to the two-pore-domain potassium channel TASK-1. A combination of electrophysiology and molecular modeling is used to characterize inhibition and to infer the structure of the drug-channel complex. The major finding of the paper is that bupivacaine binds to the "fenestrations", protein cavities whose volume decreases dramatically on transitioning from the "down" to the "up" state. The hypothesized selective affinity for the "down" state then rationalizes the inhibitory effect, since voltage-dependent opening of the channel preferentially occurs from the "up" state. The paper is well written and overall compelling. The conclusions are supported by a careful combination of experiments and calculations. Concerning the molecular modeling component, the calculations have been competently performed and rigorously analyzed. I recommend publication of this manuscript after the authors have addressed the following concerns. a) Choice of the template: several experimental structures have been preliminary explored, what is the phylogenetic relationship of all these genes with TASK-1? Are these all paralogs? Which one is the closest relative? b) Side chain modeling: how was this done? This is a clearly relevant issue for subsequent docking and it is absolutely necessary for the reader to know what method was used and if more than one of the state of the art methods (e.g SCWRL) was compared. 2) Somewhat connected to the previous point is the docking protocol: given the degree of uncertainty about the side chains, it might be advisable to attempt some Induced Fit Docking, since in this approach side chains are reconstructed from scratch after the optimal docking pose has been found. This could eliminate some dependency on the initial model. 3) A crucial point supporting the allosteric mechanism is the observation from MD simulations that, without the drug, a channel starting in the "down" state transitions quickly top the "up" one (while this does not happen in presence of the drug). While I find the idea intriguing, there is little information in the manuscript about this conformational transition. A more descriptive and quantitative presentation of this result is necessary. In particular, the authors should describe the motion of the major structural elements of the channel in time to rationalize this "down" to "up" transition and compare the two cases, with and without the drug. This manuscript addresses the mechanism of action of a local anesthetic sodium channel blocker bupivacaine on TASK1/3 channels. The paper shows that the block differs in subtle but perhaps important ways from other recognized pore blockers, and the argument is made that the insights gained may lead to development of specific TASK blockers. Unfortunately, efforts to 'sell' the paper make it difficult to read, but also highlight logical weaknesses that seriously undermine the story. 1) In general, the writing style leads to some important misleads. In part, this may be a problem of literal translation from German to English (e.g. first paragraph of the Results section should be "Initially we aimed to investigate.… such as A21899.…", not as written. In the third sentence 'Speed' refers to distance travelled over time. You mean rate), but it also reflects an attempt to oversell the story, and to casually move from suggestion to acceptance. This is a problem throughout. 2) The authors stress an apparently different mechanism of action for bup vs the other blockers, but this seems a bit of a stretch. First, the voltage-dependence of block (Figure 1C) is extremely shallow – too shallow to calculate apparently, and there is a hint of voltage-dependence in the A1899 and A293 records, which could be more apparent at higher concentrations, or more negative voltages. Second, while pointing out novel residues identified as affecting block, the authors seem to ignore the relevance of key residues involved in A1899/A293 block (i.e. res 118, 235, 239 and 240) also being key to bup block. The authors also uncritically assume that these residues are directly involved in blocker binding, but the old saw remains true – action does not imply binding. It is conceivable that additional residues affect the block allosterically. Somewhere it would be beneficial to see the structures of each of the blockers. Finally, the authors highlight the apparent preferential inhibition of the 'activating' fraction of the current at positive voltages by bup, but not the other blockers. This fraction appears to be ~20% of the control current at +70mV, but this fraction seems not only to be lost for 500 μM bup, but also seems to be reduced by much lower concentrations of A1899 and A293. 3) In the process of explaining the results the authors make 2 novel suggestions: (1) that voltage dependent gating of TASK channels involves "down"-to-"up" conformational changes and closing of the fenestrations; and (2) that bupi binds within the fenestrations to exert its effect. The authors use alanine-scanning mutagenesis to probe the binding site for bup. Later, they propose that bup may prevent voltage-activation by binding within the fenestrations and preventing the down-to-up conformational changes involved in voltage-dependent activation of TASK channels (a new concept). In this model, bup binding must be state-dependent. So, any of the mutations identified as hits from the alanine scan could easily decrease drug sensitivity by shifting the conformational equilibrium or channel gating behaviour. In this regard it would be important to demonstrate that the most important/impactful mutations do not significantly alter intrinsic channel behavior. This idea is clearly illustrated in the data: Mutation of the pore helix residue T199 reduces inhibition. But if inhibition preferentially blocks voltage-dependent gating, and mutation of T199 abolishes voltage-dependent gating – then it follows that block will be affected, and interaction with this site is not proven. In subsection “TASK-1 channels are fenestrated providing the bupivacaine binding site” they state "Here we noted that the best overlap with our functional data is given for docking solutions with bupivacaine located in the side fenestrations…". This approach seems biased. Rather than performing unbiased docking and then taking the most likely poses for testing, they have selected docking results to fit the previous data – how was "best overlap" determined? They also state that docking solutions increase as the size of the fenestration increases – this seems like a tautology. Nothing will bind if there is no room? Support for the fenestration binding site would be provided by showing the drug acts in a state-dependent manner on other K2P channels, e.g. what effect does mechanoactivation of TRAAK/TREK channels have on the voltage-independent inhibition by bup? In Results paragraph one the authors state that "varying the intracellular pH…did not alter the TASK-2 affinity". Use of "affinity" should be avoided for referred measures of effect, better to use "apparent affinity" or "sensitivity". More importantly, pHi does induce a significant shift in sensitivity. This is of course hidden somewhat by the log plot of IC50 in Figure 1R, but there is ~ 3 fold decrease in IC50 from neutral to pH 9, right around the predicted pKa8.1 of bup (https://pubchem.ncbi.nlm.nih.gov/compound/bupivacaine), although within the confines of the channel pore, free solution estimates may not be relevant anyway. The authors present a model wherein voltage-dependent conformational changes move channels into the up state, and bup binding prevents this conformational change. If correct, then voltage-activation should decrease accessibility of the fenestration binding site for bup, and thereby decrease drug sensitivity. However, there is scant evidence to support the model that voltage-gating involves down-to-up transitions, and as the model for bup inhibition relies on this premise, the proposed paradigm breaks down: The authors draw analogies to TREK/TRAAK channels and suggest that bup may bind and prevent voltage-dependent gating by preventing down-to-up conformational changes (subsection “MD simulations – binding in the fenestrations prevents fenestration gating” and “Bupivacaine stabilizes the closed state of TASK channels”). However, for TREK-2, voltage-dependent activation, has no major effect on state-dependent inhibition by norfluoxetine – suggesting that voltage-dependent gating does not involve down-to-up transitions (McClenaghan et al., 2016). Furthermore, Schewe and colleagues previously showed that AA and stretch activation (which provoke down-to-up transitions: Aryal et al. 2017, McClenaghan et al., 2016, Brennecke et al., 2018) converts channels into non-voltage dependent, constitutively open states. Taken together, this suggests that up-to-down transition gating and voltage-dependent gating may be structurally distinct. Therefore it is not logically clear why bup binding and prevention of down-to-up transition would specifically affect voltage-dependent gating. 4) The above are concerns with the results and interpretations themselves. In the text describing them, there are many somewhat rhetorical, but potentially misleading statements that are apparently there to guide the reader to the authors' desired interpretation. For instance "These data argue against a contribution of the biophysical features, like the charge of the compound, to the voltage-dependent inhibition". First, the data being described don't fit – for TREK1, TRAAK and TASK2 the trend is also towards a qualitatively similar (if even weaker) voltage-dependence (Figure 1P). Second, it is not clear how the biophysical features, including the charge of the compound, could NOT contribute to the voltage-dependence? The authors state that "TASK1.… most likely reflecting increased currents due to the K flux gating at the selectivity filter.." and that ".. K2P channels operate as a one-way check valve..". This is not the case – the current is for the most part linear around the reversal potential. And "..time-dependent current 'inactivation'" is not at all visible in Figure 1A. Then the authors conclude the first section with "Our data indicate that bupivacaine does not act as a classical open channel blocker", and "is utilizing a novel K2P channel inhibiting mechanism impairing voltage-dependent K flux gating". At least the first point seems incorrect – everything points to a very weakly voltage-dependent block from somewhere below the selectivity filter – classical pore blocking. In this regard, 'trans knock-off' experiments assessing the ability of external [K] to influence the block would be informative. Sentence two should be "no crystallographic structures have been reported so far…" and "valuable predictions regarding the structure"
Sentence four:. "Currently, the most likely model is.." is oxymoronic and a biased statement. 'Likely' means likely to be correct, but a model is never correct. Should read something like "A likely model is" or to be rally agnostic "One model is"
Discussion paragraph two: "TASK channels provide two side fenestrations as allosteric binding sites for the channel inhibition we describe here", and paragraph three "Bupivacaine located in the side fenestrations interacts with residues of the second pore helix. These sentences mix up so many interpretations, hopes, and potential falsehoods – all as fact, that I am not sure where to begin to parse them out. Paragraph four: Finally "These drugs would have little or no effect on the membrane potential…" seems to indicate a lack of understanding. We are talking about K channels, and blocking them will affect the membrane potential. The voltage-dependence of the block itself is not the relevant issue. Thank you for resubmitting your work entitled "The molecular basis for an allosteric inhibition of K+-flux gating in K2P channels" for further consideration at eLife. Your revised article has been favorably evaluated by Richard Aldrich (Senior Editor), a Reviewing Editor, and two reviewers. 1) The clarifications regarding the proposed model not claiming that the 'down' to 'up' transition is intrinsically voltage-dependent, that the authors conclude that bup prevents transition from 'down' to 'up' conformations, and that voltage-dependent gating preferentially occurs from the 'up' state, are appreciated. However, there is still some concern that the model is built upon a flawed premise. The authors are correct in saying that the Aryal et al., Brennecke and de Groot, and McClenaghan et al., papers suggest that the related TREK/TRAAK channels preferentially open from the up state (as stated in the Introduction and Discussion first paragraph), but these studies do not support the proposal that voltage-dependent activation preferentially occurs from the up-state. On the contrary, in TREK/TRAAK channels, mechanical activation involves down-to-up transitions, which Schewe et al., show involves conversion to the non-voltage-dependent "leak-mode". Therefore, the 'up' conformation will be less voltage-sensitive in TREK/TRAAK channels, which does not provide support for voltage-dependent activation of K2P channels in general occurring preferentially from the up-state as proposed in the Introduction and Discussion paragraph one. Since some of the present authors are also key authors on the Cell 'leak-mode' paper, perhaps they can clarify this apparent contradiction. 2) Furthermore, the present model relies on TASK channels interconverting between down and up conformations, which in itself is still a novel idea and cannot be assumed to occur by simple analogy with related TREK/TRAAK channels. The MD simulations provide the only hint that such conformation changes occur, and there does not appear to be any experimental evidence. What do the authors propose controls this interconversion? Is this involved in normal channel gating/regulation? Interestingly, the authors state that a leak mode has never been reported for the TASK channels. Could this be because they never adopt an 'up' conformation? 3) In the absence of experimental evidence for 'down' to 'up' conformational changes (MD simulations aside), and the questionable logic that voltage-dependent gating occurs preferentially from the up state, the proposed model still falters. Accepting the extensive mutagenesis, docking, and new K+ knock-off experiments (a welcome addition), which do support the idea that bup binds within the fenestrations, is it not equally plausible (and applying Occam's razor, more so), that bup binding is more likely to allosterically prevent voltage-dependent selectivity filter gating (flux gating) without any need to invoke down-to-up conformational changes – as is actually suggested in Discussion paragraph four? Thank you for reviewing the manuscript and for your positive and constructive comments. Please note that we (i) confirmed our initial docking results with the help of induced fit dockings, (ii) provided a descriptive and quantitative analysis of the transition from `down´ to `up´ state, and (iii) improved the methodical information regarding the template choosing, docking, and side chain modelling. Thank you for this excellent advice. We performed Schrödinger's Induced Fit Docking (IFD) by docking the active ligand with Glide (see revised Materials and methods section). Indeed the suggested approach reduced some dependency from the initial model, leading to docking solutions in the side fenestrations of all homology models that are highly similar to that we reported in the initial manuscript. Thus, our IFD experiments confirmed the binding site we initially proposed. In our IFD approach we first generated 20 different starting structures (seeds) for each homology model, by taking a frame from a MD simulation every 0.5 ns. We performed IFDs using the 20 different starting structures for each homology model. This reflects 40 or only 20 IFDs per homology model if only one fenestration is in the open state. IFD provides, only if a successful docking is performed, the best binding pose. In the TASK‐1 model based on TWIK‐1‐OO, IFD successfully found a binding pose in all the 40 fenestrations of the 20 structures, showing the highest success rate of the IFD dockings (Figure 4—figure supplement 2A). As the highest success rate was given in the TWIK‐1‐based homology model and TWIK‐1 is the closest relative of the crystallized K2Pchannels, we selected the pose with the lowest IFD energy that is also consistent with the TEA versus TPA competition experiments, an approach that we have also chosen in the manuscript for the classical docking experiments. This IFD solution in the TWIK‐1‐OO based TASK‐1 homology model is very similar to the one obtained by classical docking (Figure 4—figure supplement 2B‐C). In another set of experiments that was not included in the revised manuscript, we grouped all the poses obtained in the four models using the conformer cluster script (www.schrodinger.com/scriptcenter/) following a structural alignment between the homology models. The clustering was performed by RMSD (≤2Å) considering only the heavy atoms of bupivacaine. Within the significant clusters (Bottegoni et al., 2006), we selected the pose with the lowest IFD per cluster, which was consistent with the TEA and TPA experiments, as described above. Using this approach, we identified only one cluster where the pose with the lowest IFD was consistent with the TEA and TPA experiments. Strikingly this pose is the same docking solution as presented in the new Figure 4—figure supplement 2. The different clusters obtained in the side fenestrations of the different homology models support however your initial expectation that the IFD approach reduced some dependency from the initial model (not illustrated). Thank you for reviewing our manuscript. Obviously there were misunderstandings in the way you understood our manuscript, i.e. we do not claim that the `down´ to `up´ transition is voltage‐dependent. We hope that we have convinced you with the explanations of our data provided in the point‐by‐point response in such a way that the manuscript is now more comprehensive and the interpretations are easier to follow, so you do not get the impression anymore that we want to `sell´ something non‐conclusive. First of all, we would like to apologize for the unprecise expressions which we have carefully removed from the manuscript as you suggested. However, please note that the other Referee does not share your opinion that we attempted to `oversell´ the story, for instance reviewer #1 stated: “The paper is well written and overall compelling.” We agree that the writing style needed improvements and we are thankful for your suggestions how to achieve this. Thus, we corrected all the problematic phrases you identified. 2) The authors stress an apparently different mechanism of action for bup vs the other blockers, but this seems a bit of a stretch. First, the voltage-dependence of block (Figure 1C) is extremely shallow – too shallow to calculate apparently, and there is a hint of voltage-dependence in the A1899 and A293 records, which could be more apparent at higher concentrations, or more negative voltages. We agree that the voltage‐dependence is shallow, however it is similar to classical voltage‐dependent blockers, i.e. as observed for voltage‐dependent Kv1.5 blockers (i.e. Longobardo et al., 2000, PMID: 10807678). We do not agree that the voltage‐dependence is to shallow to calculate and the quantification that we have provided clearly showed a highly significant (p<0.001) voltage‐dependent block by bupivacaine, with a 2.5‐fold more pronounced inhibition at +70 mV compared to ‐70 mV, as analyzed in Figure 1D. In contrast, A1899 and A293 did not show a hint of voltage‐dependence or even significant differences in inhibition over this wide voltage range (Figure 1I,N). In the revised manuscript, we have also included the respective statistics in the panels of Figure 1C,H,M. In addition, the concentrations were well chosen and comparable for all three drugs, as these were consistently chosen to approximately cause sixty percent inhibition at potentials around 0 mV, to optimally resolve putative differences occurring with more and/or less pronounced inhibition. Thus, we think that increasing the concentrations will not help to further resolve a voltage‐dependence. As we did not observe significant changes in the quantification probing voltage‐dependent inhibition by A1899 and A293 (Figure 1I,N), we think that there is no need to further extent the voltage range of our experiments which also seems sufficient with a Δ of 140 mV. A Woodhull analysis for bupivacaine inhibition of TASK‐1 yields values similar to that of weak voltage‐dependent blockers as noted above, while we could not successfully fit the data of A1899 and A293. However, we did not provide a δ‐value for bupivacaine in TASK‐1 in the manuscript, as the Woodhull‐model assumes that only one charged molecule binds in the central pore of a channel (Woodhull, 1973, PMID: 4541078). Thus, this model is not sufficient to explain our complex binding mode in which the drug is not positioned in the central cavity, as two molecules might sense the voltage and as our data clearly indicate that it is not exclusively the charged molecule that causes the inhibition. Please also note that this analysis does not provide a quantification of the extent of voltage‐dependence, but rather makes predictions towards the fraction of the transmembrane potential field through which the blockers move to reach their binding site (Woodhull, 1973, PMID: 4541078). As we have already mapped the binding site and as this is located outside the water filled central cavity, we do not think that providing data of a Woodhull analysis would improve the manuscript. Second, while pointing out novel residues identified as affecting block, the authors seem to ignore the relevance of key residues involved in A1899/A293 block (i.e. res 118, 235, 239 and 240) also being key to bup block. The authors also uncritically assume that these residues are directly involved in blocker binding, but the old saw remains true – action does not imply binding. It is conceivable that additional residues affect the block allosterically. Somewhere it would be beneficial to see the structures of each of the blockers. Please note that your statements about the key residues involved in A1899/A293 block (i.e. res 118, 235, 239 and 240) are not fully correct, at least for A293. Firstly, the A293 binding site was not yet reported/published and secondly, it is different to that of A1899 which we can clearly state, as we have mapped the residues relevant for A293 inhibition (manuscript currently under revision). A293 does not involve all key residues of A1899, i.e. mutating the key residue I235 leaves A293 inhibition unaffected. Nevertheless, we have included a small section explaining the partial overlap in the A1899 and bupivacaine binding site, as it is important to explain to the reader that many of the A1899 binding residues are not strictly `pore facing´ (Streit et al., 2011) and are likely to be also accessible from the side fenestrations (Ramirez et al.,2017). This section, together with the fact that we were able to verify contacts of bupivacaine with these residues in MDs, should prevent misinterpretations that we simply ignored `pore facing´ residues for bupivacaine binding. Thank you for the excellent point that we should more carefully discriminate between binding and action which we carefully checked throughout the manuscript. In this context, we have also included a small Discussion section on allosteric effects. Thank you for the suggestion to illustrate the chemical structures of bupivacaine, A1899 and A293 which are now included in the revised Figure 1 (Figure 1A, F and K). Finally, the authors highlight the apparent preferential inhibition of the 'activating' fraction of the current at positive voltages by bup, but not the other blockers. This fraction appears to be ~20% of the control current at +70mV, but this fraction seems not only to be lost for 500 μM bup, but also seems to be reduced by much lower concentrations of A1899 and A293. Thank for discussing this point. As you have got the wrong impression that also A1899 and A293 seem to affect the activating fraction of the current, we have quantified the inhibition of the K+‐flux gated component which is now displayed in the new Figure 1—figure supplement 3. Here we can now more clearly show, that the `activating´ fraction is only significantly reduced for bupivacaine, but not for A1899 and A293. In these experiments lower concentrations of A1899 and A293 were used in order that all compounds cause a similar extent of inhibition at potentials around 0 mV, as discussed above. Thank you for this careful discussion of our data. However there is a misinterpretation of our statements, as we did not propose a new concept of channel gating with a voltage‐dependent transition from the `down´ to the `up´ state. Although we propose that bupivacaine binds within the fenestrations to exert its effect, we do not state that the `down´ to `up´ state conformational change is voltage‐dependent. On the contrary, we proposed that binding of bupivacaine in the fenestration sterically prevents the `down´ to `up´ transition. However, as the voltage‐dependent opening of the selectivity filter (Schewe et al., 2016) preferentially occurs from the `up´ state (Brennecke and de Groot, 2018; McClenaghan et al., 2016), we observe a preferential inhibition of the voltage‐activated outward currents, as the precondition of the channel to be in the `up´ state is reduced (see Figure 6C‐D). As our theory was not sufficiently explained in the Results section, we provided a more detailed interpretation of our data in the revised Discussion section (paragraph one). We agree that it is crucial to check whether mutants introduced by site directed mutagenesis exhibit altered kinetical properties, to avoid false positive hits in alanine scanning approaches. For this purpose we showed in the initial manuscript currents of the A114V, F194A und L239A mutations. Nevertheless, we found that the residues we identified in our alanine scan do not show strikingly different kinetical features. Also the T93C and T199C mutants described by Schewe et al. do not show unusual current or channel behavior in our hands using TEVC recordings. For sure alanine mutations in our scan have variable kinetics, however for the crucial hits in the pore helix with T93C, T199C and F194A we observed changes in the current kinetics which are within the normal variance. In subsection “TASK-1 channels are fenestrated providing the bupivacaine binding site” they state "Here we noted that the best overlap with our functional data is given for docking solutions with bupivacaine located in the side fenestrations…". This approach seems biased. Rather than performing unbiased docking and then taking the most likely poses for testing, they have selected docking results to fit the previous data – how was "best overlap" determined? Selection of the best docking solution was performed in an unbiased manner, as explained in the initial manuscript. Briefly, docking poses within significant clusters were analysed using MM‐GBSA and the most stable docking solutions were generated using the TWIK‐based TASK‐1 homology model. Within these poses, the experimental interaction score (EIS), a score for each interaction between bupivacaine and the residues of the binding site for each pose, was assigned (Ramirez et al., 2017). The best overlap with the functional data (the best EIS) is given for a docking solution of bupivacaine located in the side fenestrations of TWIK‐1. As reviewer 1 suggested, we performed Induced Fit Docking (IFD) experiments. Therefore, we performed Schrödinger's IFD by docking the active ligand with Glide (see revised Materials and methods section). Indeed the suggested approach confirmed the binding site we initially proposed. In our IFD approach we first generated 20 different starting structures (seeds) for each homology model, by taking a frame from a MD simulation every 0.5 ns. We performed IFDs using the 20 different starting structures for each homology model. This reflects 40 or only 20 IFDs per homology model if only one fenestration is in the open state. IFD provides, only if a successful docking is performed, the best binding pose. In a TASK‐1 model based on TWIK‐1‐OO, IFD successfully found a binding pose in all the 40 fenestrations of the 20 structures, showing the highest success rate of the IFD dockings (Figure 4—figure supplement 2A). As the highest success rate was given in the TWIK‐1‐based homology model and TWIK‐1 is the closest relative of the crystallized K2Pchannels, we selected the pose with the lowest IFD energy that is also consistent with the TEA versus TPA competition experiments, an approach that we have also chosen in the manuscript for the classical docking experiments. This, IFD solution in the TWIK‐1‐OO based TASK‐1 homology model is very similar to the one obtained by classical docking (Figure 4—figure supplement 2B‐C). They also state that docking solutions increase as the size of the fenestration increases – this seems like a tautology. Nothing will bind if there is no room? Support for the fenestration binding site would be provided by showing the drug acts in a state-dependent manner on other K2P channels, e.g. what effect does mechanoactivation of TRAAK/TREK channels have on the voltage-independent inhibition by bup? We agree that nothing can bind if there is no room. However, the fact that there is enough space does not conversely mean that a compound is likely to bind there. For instance A1899 and A293 do not bind in the side fenestrations even when they are in the open state. Strikingly, bupivacaine, unlike A1899 and A293, has a preference to bind to theses fenestrations once they are in the open state. 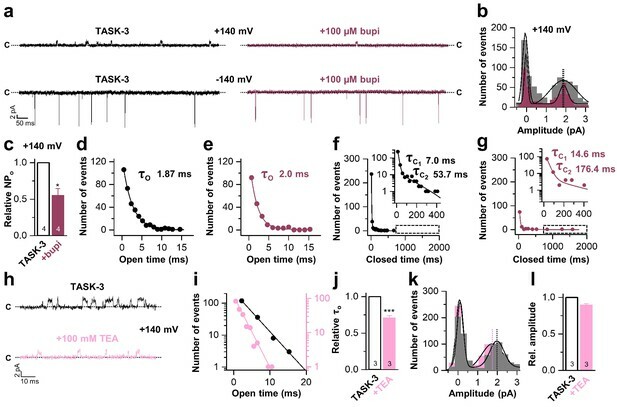 We do not agree that showing a state‐dependent block in other K2Pchannels supports our observation of a binding of bupivacaine to the side fenestrations of TASK‐1. Please note that the fact that bupivacaine does not cause a voltage‐dependent inhibition of all K2Pchannels is more in line with our hypothesis that it is not the charged bupivacaine in the central cavity which is causing the voltage‐dependent inhibition of TASK‐1. Conversely, we have identified a binding site unique to the TASK‐1/3/5 family and consistently we only get a significant voltage‐dependent block within this family. As we did not observe a voltage‐dependent inhibition of channels in the TREK/TRAAK family we did not perform experiments on the influence of bupivacaine on the mechano‐activation of TRAAK/TREK channels. Thank you for the suggestions how to improve the manuscript. We followed your suggestion and replaced `affinity´ by `sensitivity´ where appropriate. Please note that we did not intend to hide effects, when we considered that using a logarithmic scale would be a suitable way to display effects by changes in pH values. In fact you were able to note the approximately 3‐fold decrease in IC50. Considering the pKs of bupivacaine in free solution, a change from pH 5 to 9 would however mean a change of 99.9% charged bupivacaine to less than 10% of the charged compound. Albeit we agree that it is difficult to ultimately predict the pKs of bupivacaine within a protein environment, the observed three‐fold change in IC50 over this large pH range appears far too little to claim that it is primarily the charged compound mediating the channel inhibition and thus the voltage‐dependence of block. As also discussed in the first version of the manuscript – if it is really primarily the charged bupivacaine causing a classical voltage‐dependent pore block, this voltage‐dependence depending on the physicochemical features of bupivacaine should, at a given pH, occur also in the other bupivacaine‐sensitive K2Pchannels. 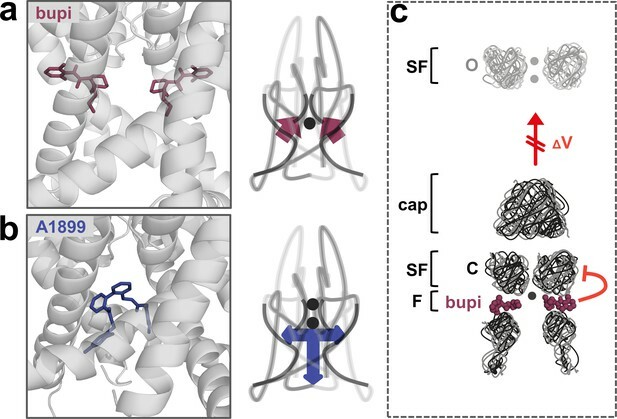 The authors draw analogies to TREK/TRAAK channels and suggest that bup may bind and prevent voltage-dependent gating by preventing down-to-up conformational changes (subsection “MD simulations – binding in the fenestrations prevents fenestration gating” and “Bupivacaine stabilizes the closed state of TASK channels”). However, for TREK-2, voltage-dependent activation, has no major effect on state-dependent inhibition by norfluoxetine – suggesting that voltage-dependent gating does not involve down-to-up transitions (McClenaghan et al., 2016). Although we did not claim that the `down´ to `up´ transition is voltage‐dependent in TASK‐1 (see points above), we agree that it is on a first thought puzzling that drug binding to somewhat similar binding sites can result in a voltage‐dependent block in one class of ion channels but not in another. Although it appears that the binding site of norfluoxetine in TREK‐1 is quite similar to that of bupivacaine in TASK‐1, it is possible that norfluoxetine does not as efficiently prevent the `down´ to `up´ transition in TREK‐1. In addition, it is known for ion channel blockers that subtle changes in the binding mode of different substances can already lead to strong changes in the kinetics of block, i.e. in the case of Kv1.5 blockers (Strutz‐Seebohm et al., 2007, PMID: 17982261; Decher et al., 2004,; Decher et al., 2006, PMID: 16835355). Furthermore, Schewe and colleagues previously showed that AA and stretch activation (which provoke down-to-up transitions: Aryal et al. 2017, McClenaghan et al., 2016, Brennecke et al., 2018) converts channels into non-voltage dependent, constitutively open states. Taken together, this suggests that up-to-down transition gating and voltage-dependent gating may be structurally distinct. Therefore it is not logically clear why bup binding and prevention of down-to-up transition would specifically affect voltage-dependent gating. 4) The above are concerns with the results and interpretations themselves. In the text describing them, there are many somewhat rhetorical, but potentially misleading statements that are apparently there to guide the reader to the authors' desired interpretation. For instance "These data argue against a contribution of the biophysical features, like the charge of the compound, to the voltage-dependent inhibition". First, the data being described don't fit – for TREK1, TRAAK and TASK2 the trend is also towards a qualitatively similar (if even weaker) voltage-dependence (Figure 1P). We are somewhat disturbed by the referees opinion that we should not guide the reader to understand our interpretations while on the contrary he himself considers somewhat rhetorical or misleading statements when he is referring to or interpreting non‐significant baseline variations. We strongly object to this point, as there are only minor, no or only minimal trends, but not a significant voltage‐dependent block of other K2Pchannels (Figure 1P). Thus, the referee´s statement is not correct! The voltage‐dependent inhibition cannot reflect an unspecific open channel block of all K2Pchannels which is mediated exclusively by charged/protonated molecules, while one type of K2Pchannel is blocked in a voltage‐dependent manner with a p<0.001 and the other channels at the same pH show only non‐significant or not voltage‐dependent changes at all. Yet, we agree that the sentence was not phrased clearly enough and we have improved it to avoid misunderstandings. It now reads: “These data argue against a sole contribution of the protonation state and that only charged molecules cause the voltage-dependent inhibition”. Second, it is not clear how the biophysical features, including the charge of the compound, could NOT contribute to the voltage-dependence? The authors state that "TASK1.… most likely reflecting increased currents due to the K flux gating at the selectivity filter.." and that ".. K2P channels operate as a one-way check valve..". This is not the case – the current is for the most part linear around the reversal potential. And "..time-dependent current 'inactivation'" is not at all visible in Figure 1A. The biophysical features do of course influence affinity and kinetics of most blockers. However, if the blocker is not sensing the electrical field or is not able to move because of the electrical field, then it is not exclusively the charged compound that blocks the channel. This idea is supported by our unusual binding site and that the IC50 of the drug was not strongly depending on the pHi and the protonation state of the blocker. As discussed above we have replaced the sentence about the biophysical features. It now reads: “These data argue against a sole contribution of the protonation state and that only charged molecules cause the voltage-dependent inhibition”. We were basically referring to the study by Schewe et al. and to our recordings in which we observed a decay of the inward currents over time when stepping to hyperpolarized potentials. However, we agree to your point that the current voltage relationship is for the most part linear around the reversal potential and thus deleted the statement about the one way check valve from the manuscript. Then the authors conclude the first section with "Our data indicate that bupivacaine does not act as a classical open channel blocker", and "is utilizing a novel K2P channel inhibiting mechanism impairing voltage-dependent K flux gating". At least the first point seems incorrect – everything points to a very weakly voltage-dependent block from somewhere below the selectivity filter – classical pore blocking. In this regard, 'trans knock-off' experiments assessing the ability of external [K] to influence the block would be informative. We strongly disagree to your statement that everything points towards a classical pore block. Both, the mapping of the drug binding site with alanine mutagenesis screens and the molecular docking experiments show that the binding site is different to that of classical TASK open channels blockers. This novel binding site and the novel mechanism of inhibition are supported by the TEA versus TPA competition experiments, the differences in the ion solvation free energy profiles comparing charged TEA with charged or neutral bupivacaine located at its binding site and by the single channel analyses that clearly show difference in block mechanism between TEA and bupivacaine. With all these data pointing to a non‐classical pore plugging mechanism the most straightforward interpretation is an allosteric block mechanism. This allosteric block mechanism was subsequently successfully probed with molecular modelling experiments and put into a hypothesis/model that explains our experimental findings of primarily reduced outward currents, while at the same time implementing the current knowledge about K2Pchannel gating. As requested, we performed `trans knock‐off´ experiments which strongly support the accumulated data that conclusively indicate that bupivacaine is not a classical open channel blocker of TASK‐1 channels (Results paragraph two and new Figure 1—figure supplement 4). We have previously reported that TASK‐1 inhibition by the open channel blocker A1899 is attenuated by extracellular potassium (Streit et al., 2011). Strikingly, while increasing extracellular potassium concentration gradually decreased TASK‐1 block by A1899, the inhibition of TASK‐1 by bupivacaine was not affected (Figure 1—figure supplement 4). Sentence four: "Currently, the most likely model is.." is oxymoronic and a biased statement. 'Likely' means likely to be correct, but a model is never correct. Should read something like "A likely model is" or to be rally agnostic "One model is"
Thank you. We have fixed the three sentences. Thank you. However, we agree that this idea was not phrased well enough. The theory discussed in the manuscript was: as the block is voltage‐dependent and primarily occurring at depolarized potentials, a novel class of voltage‐dependent blockers that utilize this mechanism and only block at depolarized potentials, should leave the potassium channels unbiased and thus the membrane potential, as long as the membrane potential constantly remains hyperpolarized. As we do not intent to confuse the reader, obviously as we did here, and as we did not provide experimental evidence for this theory, we have removed the paragraph from the Discussion section. Thank you for this discussion and criticism. We agree that we cannot finally prove the novel model that we have initially proposed and that we should not concomitantly transfer this novel model to a channel of another family. After I have discussed all the data again with Thomas Baukrowitz, we agree that our initial model might be too farfetched and we have chosen a more moderate model. We have changed the revised manuscript accordingly and do not claim anymore that these channels must have gated fenestrations and that preventing the gating of the fenestration must be the principle mechanism of action. We also do not claim anymore that TASK channels must exist in `up´ and `down´ states and that the `up´ state is the state from which voltage‐dependent opening preferentially occurs. We followed your suggestion of applying Occam's razor and only state that we identified a novel allosteric mechanism of TASK inhibition resulting from binding of bupivacaine to lateral fenestrations of TASK‐1 and that bupivacaine reduces the voltage‐dependent K+‐flux gating leading to a weak voltage-dependent inhibition. The Figure 6 illustrating the mechanism of action was corrected accordingly. As pointed out in point 1 and 2 we now follow your suggestion and propose that bupivacaine binding to the fenestrations is likely to allosterically prevent the voltage‐dependent selectivity filter gating (flux gating), excluding our former hypothesis that it essentially demands a down‐to‐up conformational change (revised Figure 6). We thank Oxana Nowak and Kirsten Ramlow for technical assistance. This work was supported by Deutsche Forschungsgemeinschaft (DFG) grant DE1482-4/1 to ND and Fondecyt Grant 1140624 to WG. © 2019, Rinné et al.